On December 17th. 1975, Henk de Vries established the first cannabis coffeeshop in the world. He later branded his coffeeshop in the shape of his four legged friend Joris, The Bulldog. From that day The Bulldog has expanded into an empire of 5 coffeeshops, cafes & bars, 2 hotels, smoke accessories, a merchandise line, an energy drink and more recently a cannabis seed company offering some of the finest high quality seed genetics available. The Bulldog brand has become one of most, if not the most successful recognised cannabis related companys in the world and will continue to be inspired by what the future has in store. 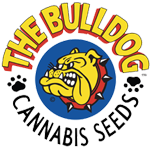 34 years after establishing the very first cannabis coffeeshop in the world, The Bulldog Amsterdam decided to team up with some of the world\'s leading cannabis seed breeders to establish The Bulldog Seeds. The Bulldog Seed Company now offers a selection of 10 of the finest feminised marijuana seed strains for a very reasonable price. The Bulldog Seeds has spent more than 5 years collecting genetics and invested in research & development to make sure that only the highest quality cannabis strains are released in their 2010 seed catalogue.